Banjoleles are an awful lot of fun..and we love em here at Lord Uke..
Gold Tone have just released the BU-1, a concert sized banjolele with gigbag and a pickup. RRP $565 our special price is $499 it's great value and so for that reason it's Uke of the week! Feel free to come and try one out! Uke of the week is the Deering Goodtime Banjo Uke. Handmade in the USA this little ripper redefines the banjolele with it's loud, clear, rich sound. The concert scale and full size 11” rim produces a wonderfully warm yet noticeably louder and fuller sound across the perfectly balanced Aquila Super Nylgut strings. These tonal characteristics are only further enhanced, not only by the naturally warm renaissance head but with the addition of the patented bridge plate. $1099 RRP all this week down to $999. Fitted, custom gig bag is available for an extra $150. We also have the Tenor size in stock for $1299. 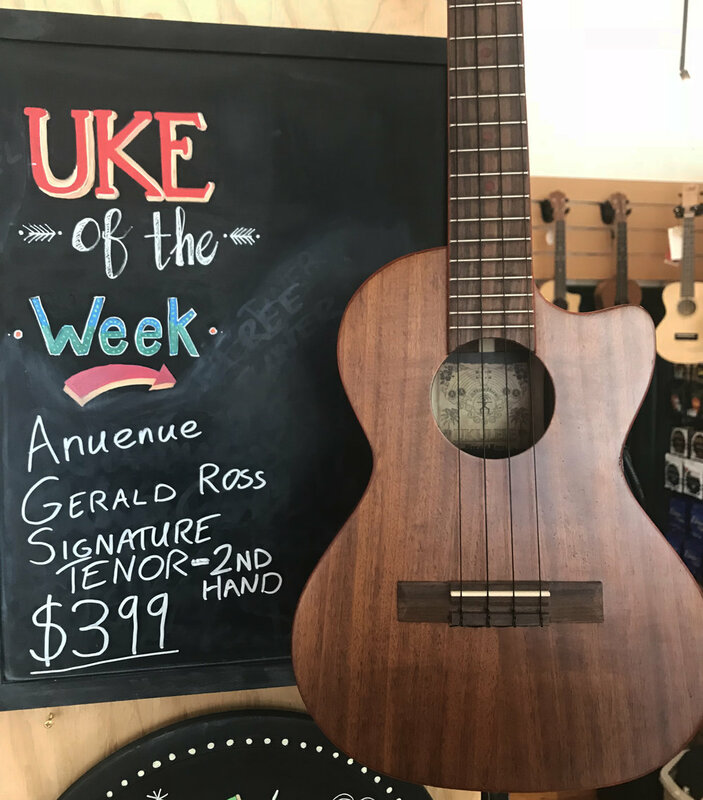 Uke of the week is this very lightly used ANueNue Guitar & Ukulele Gerald Ross signature tenor. Designed in conjunction with famed uke player Gerald Ross, it sports a Fishman passive pickup, Padauk timber binding and inlays, and a Koa body. Price is $399, with a gig bag. The aNueNue super lani is one of the most comfortable ukes I've ever played... It's undoubtedly a bright sounding ukulele, as is to be expected from the solid Spruce top. The Super Lani comes with a deluxe gig bag and at $649 it's a lot of uke...all this week receive a free aNueNue surf tuner worth $24.99. Super Lani Tenor is also in stock at $729. Words fail to describe just what a fabulous instrument this is. Open sounding, everything that you want from a Baritone and more! If you are in the area I recommend coming in to have a play. There are a few uke companies making vintage style ukes at the moment but the Ohana SK28 is a real stand out for the price. All solid mahogany and based on a 1930's Martin style 2 uke. It has all the bright and lively characteristics of the original Hawaiian ukes. Sure it doesn't have the volume of a Pono Tenor...but if you want an authentic soprano sound...it'll get you there in spades. Uke of the week is the Cordoba 15CM-E concert size uke with an inbuilt pickup with discreet soundhole controls. This is a great way to get a gig ready uke at a great price. All the 15 series Cordoba ukuleles are back in store now...we have the 15SM Soprano @ $169, 15CM Concert @ $189, 15TM Tenor @ $209 and the 15CM-E at $249. All represent great value for money and are built to last by Cordoba. Uke of the week is the Pono Tahitian Thinbody 8 string.